Wednesday was a day for the Colts on the airwaves of 1070 The Fan. The Grady & Big Joe Show along with The Ride with JMV broadcasted live from Colts training camp in Anderson. Who led the Colts in receiving during the 2012 preseason? The answer to that question might not be the guy you are thinking. With 12 catches and 125 yards receiving, Griff Whalen made the most of his opportunities as an undrafted free agent during last year’s preseason. Unfortunately a foot injury sidelined the Stanford product for his entire rookie season. Now fully healthy, Whalen is once again turning some heads, and one very important man is taking notice. Whalen has been a popular target of Colts quarterbacks early on in training camp and seems to be picking up where he left off in 2012. No. 17 has also been approached on several occasions by offensive players asking questions on the Colts new offense. With LaVon Brazill missing the first four games of the season, there are reps to be had at the fourth and fifth receiver spot in September. If Whalen can keep producing on the field, than this Colts offense will have even more Stanford flavor come the start of the regular season. 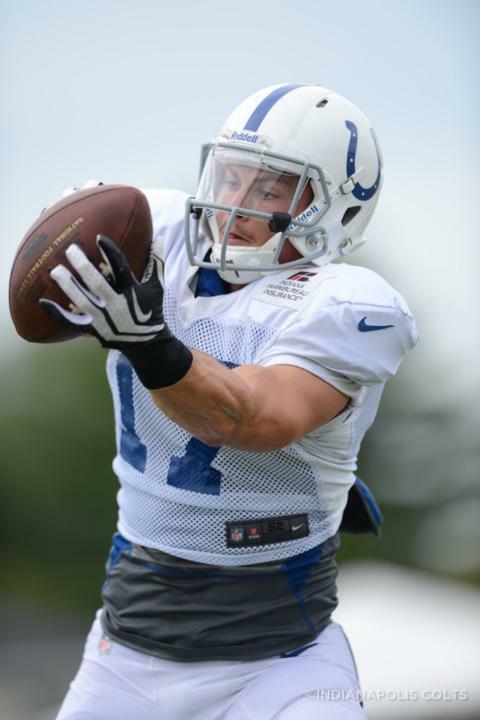 The Colts were in pads for the first time in training camp on Wednesday. Today’s headlines includes a wonderful feature on Andrew Luck, some observations from Mike Chappell on Tuesday’s practice and a look into the growth of T.Y. Hilton. Take a look below at the top pieces from Wednesday, July 31st. A tremendous piece from Jones on the Colts signal caller and his growth moving into year two. Luck’s reaction? “He just blows it off,” Allen said with a laugh. His nickname this season? “Still ‘Meal Ticket,’ ” Allen said. Chappell broke down his five thoughts from Tuesday’s first padded practice of 2013. Chappell takes a look at Antoine Bethea’s new baby girl, charting of Andrew Luck, an injury update on the Colts and the arrival of Josh McNary. It’s been a nice start to camp for second-year receiver T.Y. Hilton. Expectations have risen in year two but Hilton feels comfortable in the Colts new offense, alongside Reggie Wayne. Where exactly Hilton lines up in year two remains to be seen but rest assured he will get his touches. Not even the threat of rain could keep Braden Tamosaitis from smiling on Tuesday afternoon. Braden was having the time of his life with VIP access at Colts training camp and was about to break down the team huddle after practice. Eight-year old Braden was one of 11 Riley Hospital patients and families to receive VIP treatment on Tuesday. 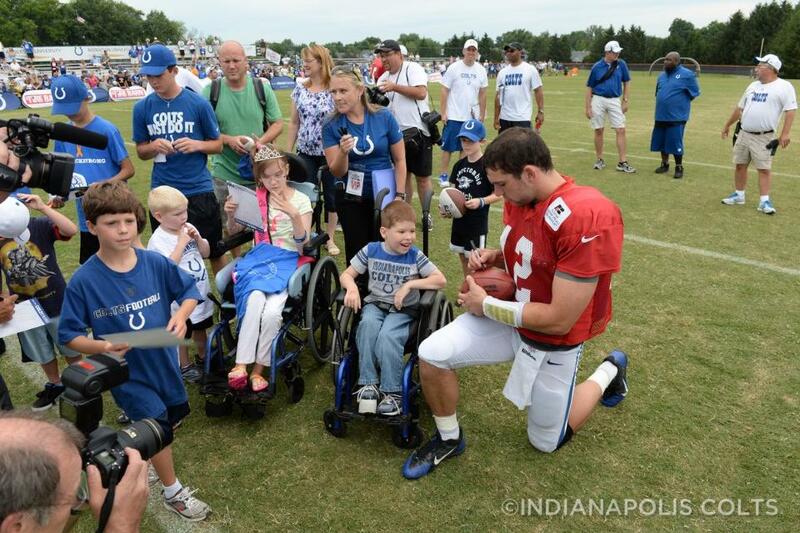 The afternoon started with families arriving to Colts training camp around 2 p.m. and touring Colts City. After that it was time to head out to practice where the children and families sat in a special tent reserved for them and enjoyed food and drinks before taking the field after the final horn sounded. Colts players and head coach Chuck Pagano then welcomed the children into their team huddle. “There are no greater warriors than these warriors right here,” Pagano said with the kids circled around him. Next up was a breakdown of the team huddle before players and Pagano hung around for individual pictures with each kid. The Indianapolis Colts today rescinded the waivers on linebacker C.O. Prime and he remains on the 90-man active roster. The team also placed nose tackle Brandon McKinney on Injured Reserve. McKinney was originally signed by the Colts as an unrestricted free agent on April 5, 2012. In 61 career games played (six starts), he has recorded 82 tackles (42 solo), two passes defensed, one forced fumble and one fumble recovery. He also has appeared in seven postseason games, totaling nine tackles (five solo), one pass defensed and one fumble recovery. The Indianapolis Colts today announced that linebacker Josh McNary has been reinstated from the Reserve/Military List to the 90-man active roster. The team also waived linebacker C.O. Prime. McNary, 6-0, 251 pounds, finished his career as Army’s all-time leader in sacks (28.0) and tackles for loss (49), while adding 195 tackles (117 solo), nine passes defensed, five forced fumbles and three fumble recoveries. He is the only player in school history to record two double-digit sack seasons and also holds school records for the most sacks in a single game (4.0) and a single season (12.5). As a senior in 2010, McNary capped off his career by returning a fumble 55 yards for a touchdown in the Black Knights’ 16-14 victory over Southern Methodist University in the Bell Helicopter Armed Forces Bowl. The win gave Army its first winning season since 1996 and first postseason victory since the 1985 Peach Bowl. Following his senior year, McNary was honored with the 2011 East-West Shrine Game Pat Tillman Award, given to the player who best exemplifies character, intelligence, sportsmanship and service. The award is about a student-athlete’s achievements and conduct, both on and off the field. Upon his graduation from West Point, McNary was commissioned as an officer in the Army, which prevented him from being selected in the 2011 NFL Draft. Prime was originally signed by the Colts as an undrafted free agent on April 30, 2013. He started 38-of-45 games at Wagner College and registered 297 tackles (111 solo), 11.5 tackles for loss, 2.0 sacks, five forced fumbles, four fumble recoveries, seven passes defensed and two interceptions. Another day down at Colts training camp. The news of Monday came with LaVon Brazill addressing his four-game suspension, Andrew Luck’s day on the practice field, Donald Thomas’ journey to playing football and what Robert Mathis main goal is in 2013. Take a look below at the top pieces from Tuesday, July 30th. Second-year wide receiver LaVon Brazill addressed the media on Monday morning for the first time since it was announced he would miss the first four games of the regular season. The second-year Colts receiver insisted it’s an easy choice: He’ll take money over marijuana any day. On Monday, Brazill promised to avoid any more off-the-field missteps as he made his first public comments since the NFL imposed a four-game suspension for a failed drug test. Brazill admitted he alone was to blame and said he has promised the Colts it won’t happen again. Chappell’s daily look at Colts training camp includes the numbers for Andrew Luck after Day Two, along with a new piece of clothing that has been spotted around Colts camp. QB Andrew Luck seemed to use every option at his disposal during 7-on-7 and team drills, connecting with eight receivers, but he ended the day on a sour note. His final pass in a two-minute drill was intercepted by CB Darius Butler. On the day, Luck completed 27-of-43 passes. WR T.Y. Hilton provided the catch of the day, a diving grab in front of the bleachers. Luck’s two-day totals: 49-of-77, two TDs, two interceptions. Another season, another motivational T-shirt. Players are wearing a T-shirt that has a hand grasping the Lombardi Trophy and the words ‘Hoist It!’ on the back. The ultimate goal is doing precisely that Feb. 2 at Super Bowl XLVIII. Last summer, players wore a T-shirt that featured a poll listing the Colts No. 32 in a power ranking. Pointer has an in-depth feature into Donald Thomas journey from a college walk-on who was found during a pickup basketball game. A few Connecticut football players urged Thomas to try out for the team and with that came a Division I career followed by a starting job in the NFL. “I never had aspirations of playing in the NFL,” Thomas said during a recent interview in the Colts locker room. “Even when I came back for my senior year, before the season started, I didn’t know I had a shot. Thomas’ college coach Randy Edsall said it was a no-brainer to give the 6-4, 250-pound freshman a tryout. Robert Mathis is a man of few words but like Chuck Pagano says, when he speaks people listen. That was the case on Monday as Mathis was the focal point following the morning walk-through. He’s arguably gotten better with age, being selected to the Pro Bowl in four of the past five seasons, and he needs just 8.5 sacks to join Freeney as the only players in franchise history with 100 career quarterback takedowns. But, true to form, that’s not at the forefront of Mathis’ mind. The Colts had a few extra voices in the post practice team huddle on Monday afternoon. The breakdown of the huddle was a culmination to a day long of activities for the “Huntington Camp Heroes” program. “The kids get to come here, get bused into Colts City, get a special viewing area, a place to eat and then the experience with Coach Pagano and the players at the end tops it off,” said Brent Frymier, Vice President of Marketing and Communications for Huntington Bank said. Along with attending the camp, the children received backpacks filled with schools supplies, t-shirts and goodie bags. The 25 kids ranging from ages 5-13 were chosen from the Lilly Boys and Girls Club in Indianapolis. As Monday afternoon’s practice concluded, the Colts huddle parted with players high-fiving the Huntington Heroes into the middle. 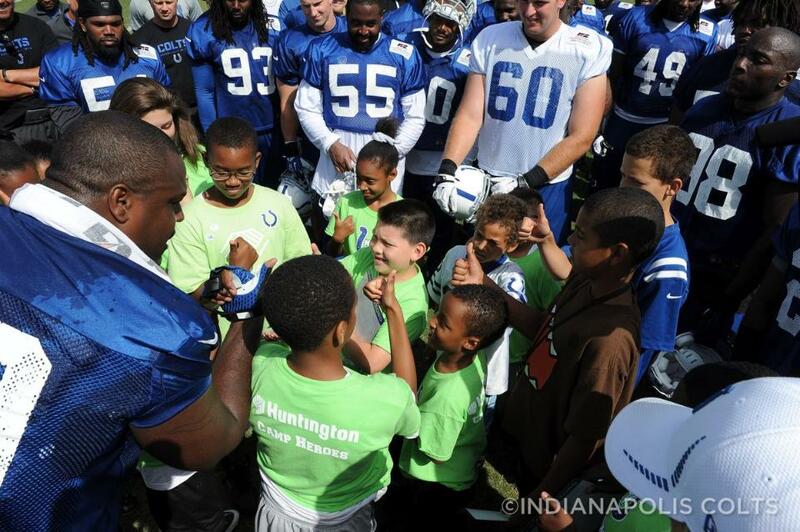 Chuck Pagano and Cory Redding addressed the youth, hoping to leave a lasting message. “It’s so great to have you guys here and we are so glad you could make it,” Pagano said to the children in the huddle. Redding had the 25 kids take a look at their thumbs and explained to them how each of their individual thumb prints are unique and to be themselves. The Huntington Camp Heroes program is in its fourth year as the partnership between the Colts and Huntington Bank continues to extend into the community.